StoryCatchers Media played an integral role in the largest awarded jury verdict in a medical malpractice case in Colorado history. Colorado Super Lawyer, Jim Puga, with Leventhal & Puga P.C., obtained a $17.8 million dollar verdict for his client against Children’s Hospital Colorado from a jury in Arapahoe County. StoryCatchers Media created several videos for this case including a Day-In-The-Life video. The case involved a then four-day-old baby named Naomi Pressey. She was born with a common congenital heart defect, which can be easily repaired with surgery. However, before she even had the surgery, baby Naomi arrested on the operating table. She could not be resuscitated for 33-minutes and suffered a severe hypoxic ischemic brain injury, resulting in cerebral palsy, among other conditions. Naomi’s life changed forever after she arrested and attorney Jim Puga claims Naomi went into a cardiac arrest because of a medication error. Puga says Children’s Hospital Colorado staff gave Naomi the wrong dose of prostaglandin, which is a medication that Naomi needed until she could have surgery. StoryCatchers Media created a Day-In-The-Life video about now seven-year-old Naomi. She suffers from significant intellectual disabilities, cognitive impairments, as well as serious gross and fine motor skill impairments. Throughout her life she will require 24/7 care and supervision. Her parents have also had to significantly change their lives because of the care their daughter requires. This video shows some of what Naomi and her family go through on a daily basis. StoryCatchers also produced other videos showing Naomi’s educational and physical disabilities. The jury was able to get an inside look into Naomi’s tutoring session. This video demonstrated Naomi’s struggles to hold a pencil, write and understand basic shapes and colors. The physical therapy video illustrated Naomi’s physical limitations including walking, kicking a ball and running. 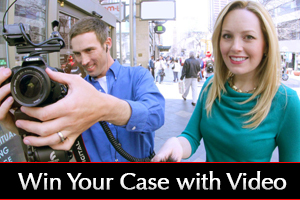 Find out how StoryCatchers Media can help you win your next case. Contact us for your next legal video.